Happy New Year everyone! It feels good to be back after a glorious holiday spent with family and friends, and of course lots of food. I really whooped it up over break continuing to experiment with the superb dishes that you submitted to the recipe challenge, and I hope that many of you took advantage of the free cookbook I put together with the best of the best. 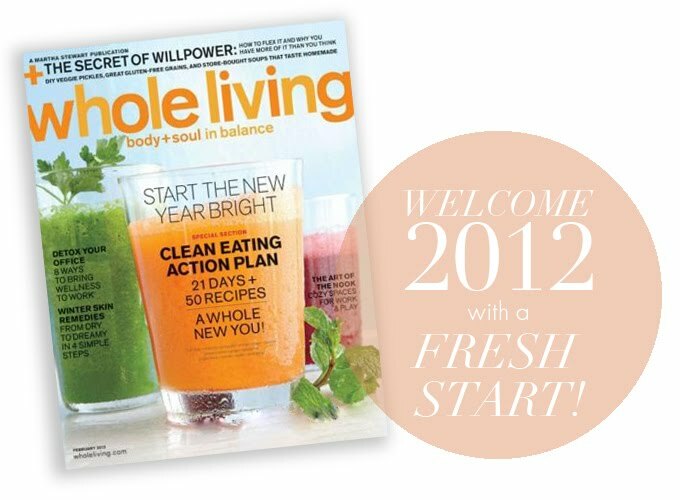 It really is a wonderful collection of delicious and healthy delights – a great way to start off 2012 in fact! As many of you know, I am a monthly contributor to Whole Living online, where I write a Meatless Mondays column and recipe. Well, the editors at Whole Living Magazine asked me to head up their January Detox Program and I leapt at the chance, obviously. The 21-day plan has over 50 recipes and plenty of lifestyle tips and advice for completing a successful cleanse. If you have never embarked on such a journey before, this is a great opportunity to try a whole body and mind clean out! The plan is not about deprivation, but centers around a plant-based diet loaded with flavour, colour, and vibrant, seasonal foods. I was in charge of the first week of the cleanse, which is the most challenging, but I promise delicious (does that food look anything but insanely luxurious? Exactly). Week 1’s breakfast, lunch, dinner, and snack recipes include fruits, vegetables, and plant-based fats, nuts, seeds, and oils, and asks you to cut out processed food or beverages, added sugar, dairy, gluten, caffeine, and alcohol. Not an easy task, but good grief will you ever feel like a million bucks. And if you can commit to the 21-day plan, which I highly recommend, you will undoubtedly feel more energized, sleep better, and likely shed some unwanted weight. What better way to enter this new year than with a new you – possibly your best self ever? If you live in a country that does not sell Whole Living Magazine, you’re in luck! The entire plan is up online and comprehensively laid out for you to follow week by week. Start today. You can do this. No more excuses! Let me know in the comments section if you’re committing to the plan, and feel free to give feedback throughout the month – after all, I made the program for you. In love and support, always! I’m loving your energy and work so much that I have decided to reset my nutrition after Christmas in order to start the year clean and embracing solid facts inside and outside the kitchen. I was thinking of following this Whole Living Detox Plan, but at the same time I find certain points that make it difficult and I am tempted of choosing the recipes and basics of your video courses in Cody (that I happily purchased few days ago) and making some source of mix&match. The facts are that I do have a blender in order to prepare smoothies, but not a juicer. In the other hand, I am not sure if I can find exactly the same organic fruits or veggies at this time of the year where I live (Barcelona), so I was wondering if there’s some equivalency I can work with. I really want to give this a try in order to evolve on my plant-based journey, could you please give me your opinion and maybe some tips? I just found this article, I love it. That stuffed avocado looks amazing!! Thanks for sharing. Just want to say your article is as surprising. The clarity in your post is simply excellent and i could assume you’re an expert on this subject. Fine with your permission let me to grab your feed to keep up to date with forthcoming post. Thanks a million and please continue the rewarding work. I needed to post you the bit of note so as to say thank you once again for your wonderful guidelines you’ve provided on this site. It’s certainly unbelievably open-handed with people like you to make easily just what a few individuals would’ve offered for sale as an ebook in order to make some bucks on their own, most importantly since you might have tried it in the event you wanted. Those suggestions also acted like the fantastic way to be aware that some people have similar dreams the same as mine to know the truth much more concerning this condition. I know there are lots of more enjoyable moments in the future for many who scan your blog post. I think other website owners should take this website as an model, very clean and fantastic user pleasant style and design . “Grant us a brief delay impulse in everything is but a worthless servant.” by Caecilius Statius. I just discovered your website. I am really enjoying all of your articles. I am also doing the Body Cleanse , although I added Alaskan Salmon in because I was unable to eat the nuts and some of the vegatables because I am having problems with my stomach. Do you think that the addition of the salmon will be detrimental to the cleanse? I also have been pretty tired and have taken it easy for the week I am on day 9 . I havent changed anything from week one yet . I did purchase most of the ingredients for the herbal detoxs tea . I am looking forward to trying it . The woman at the shop was extremely interested in your site also! I am hoping by the end of the cleanse some of my belly issues will be resolved! Thank you for your great work ! P.S. My husband would like to get me one for my birthday. I first read about your blog in the most recent issue of Bon Appetit magazine and might I say, it has been love at first sight ever since. I have already made several of your recipes to try and fool some of the other mommies, and kids, in my weekly playgroup. Is it possible to suggest a juicer? I am currently living in the US and would love some help choosing one from the many that are currently on the market. I specifically want to use it for juicing veggies and fruit. Also would like to make nut butters and milks. Wow. Late to the game but I just found your site and am SO glad I did. I’m on day four of week one and I don’t feel deprived. I love everything I’m eating and other than a minor headache (no doubt coffee withdrawal) I feel great. I did add green tea, the caffeine is minimal and I’m hoping the benefits of green tea outweigh any negative effects. 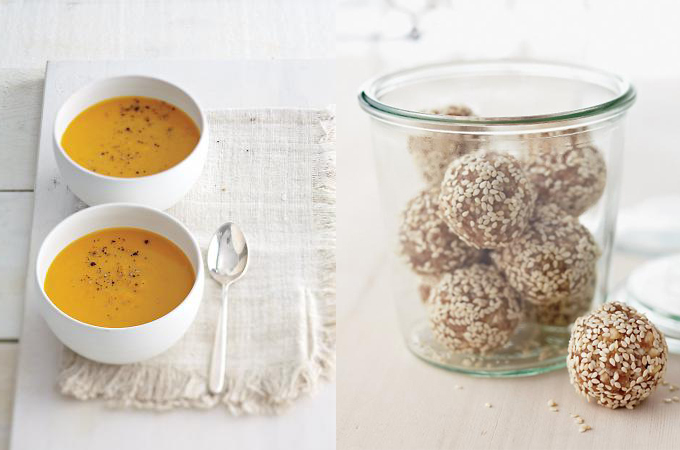 These recipes are not just for detoxing, they are forever. The kale and red cabbage salad is awesome and so easy. I’m actually eating the beet soup now and loving it, the butternut squash soup was maybe more delicious; I did roast the veggies rather than boil them. While I’m afraid to go out into the big bad world beyond my kitchen this first week – temptation is everywhere (and given my last dessert pre-detox was nutella mousse, staying put is wise)- I think that by the end of 4 weeks my eating habits will be totally changed. I can’t wait to try the recipes you have here, only 3 1/2 weeks to go! Aha! Finally figured it out. Thanks!! To luvmygirls – Yes, I know what you are referring to, but that link I gave you will click through each dish for week 1, and at the bottom of the description it will say: “Get the Steamed Broccoli and Squash with Tahini Dressing Recipe” etc. etc. Each of those 17 slides is a dish with the recipe link. Try again. Sarah, I’m sorry but what I’m trying to say is that when you click on that link and follow it through…it takes you to the shopping list (which isn’t the recipes). 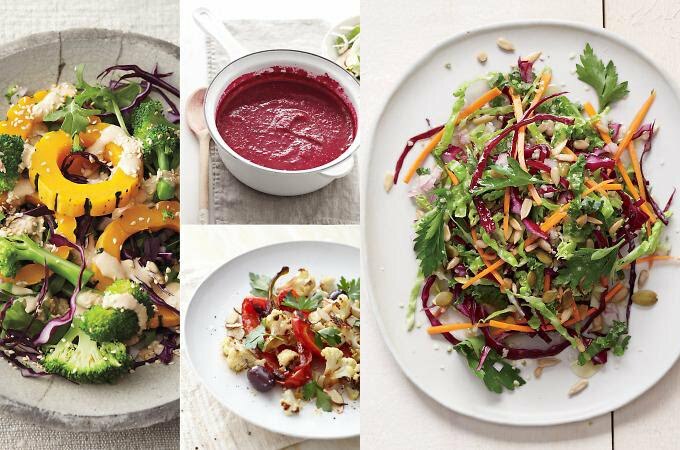 Then when you click on the recipes it takes you to a PDF of the magazine page which only lists the recipes for the Butternut soup, the Beet soup, the cabbage salad and the broccoli tahini. That’s great but not enough for all of week one. There are no other Week One recipes to be found on the site. There are many other comments listed on Whole living that talk about this problem. I can’t see making it through this whole week on two soups and two salads. There are supposed to be more recipes. The shopping list had me buy more ingredients, but I don’t know what to use them in. The recipes aren’t showing up on the Whole Living website for Week 1. Only a few. Are they listed anywhere on your blog? I am doing this in February! I actually did a post on clean living and I linked on over to here! Hope I do well! It’s never too late! You can drink smoothies for the rest of your life if you like 🙂 So yes, they are appropriate for week 2 & 3. Keep it up and enjoy! Yes, I am a little late to this game, BUT the fact is that I’m doing it. Anyway, I was wondering if it was ok to still do the smoothies some for breakfast in weeks 2 and 3. Not necessarily everyday, but maybe every other day? I’m only on day 3 but looking ahead to week 2 and 3. The food is tasty, and I already feel much better. Thanks for sharing this with everyone! Thanks for the link, Sarah! I am starting to feel better now and will read that article. I am going through the first week and something curious happend. I’m having my period now, and it is the first time in years that I dont have to take a pill for my period pains, they are much lighter this time. Probably just a coincidence, but I wanted to tell you in case diet has something to do. Hi Anon – I am sorry to hear about your discomforts, but trust me they are normal. Even though you may eat a healthy diet, we all have some toxic build-up from pesticides, EMFs, stress, pollution etc. What you are going through is a good thing, as your body is now removing the waste products from deep inside. Read this article for some reassurance, drink PLENTY of water, get to a sauna if you can, and in a very short time your symptoms will pass! I don’t know what happened to myself or where I’ve gone wrong but I became so sick on this detox. It’s kind of embarrassing what I’m going through…. going through chronic bouts of constipation and diarrhea (it’s almost like I have IBS but I can assure you I don’t deal with this on a daily basis) that have made it so incredibly hard to get through the work day, the gym and complete my other goals. I prefer to be a very proactive young lady that’s generally very open-minded but when you find yourself literally crawling back to bed (even my feet hurt) from the bathroom to endure another sleepless night, you wonder – maybe this detox isn’t for me? I generally am very conscious about eating but am a small girl already (5’3, 115 pounds). I’ve eliminated high fructose corn syrup from my diet and generally eat a mostly Mediterranean diet and I feel fine…with the occasional treats here and there. I just got my copy of Whole Living in the mail yesterday. So excited to try this detox plan. My fiance is actually going to join in with me. I don’t think this is going to be too difficult for us. I am vegan and run a vegan household. I’m really excited to try some new recipes! I am about 7 weeks pregnant and would love to get rid of more toxins from my body. Right now, I don’t have the financial resources to consult a holistic nutritionist, but really want to figure out how to eat healthy, boost my energy, and detox. Do you have any suggestions for modifications to this cleanse? I have been in the process of eliminating caffeine, sugar, processed foods and most grains, so I don’t think my toxic load is too extreme right now. Just finishing Day 3…boy, the tasty food sure makes it a lot easier! Thanks for the great recipes! Hey Sarah! I just started this cleanse (after trying some of the juicing recipes a few days ago), and I have a stocked up fridge/cupboard for week 1! I’m excited. Thanks for such an organized detox for all of us newbies! Anyway, I do have a few practical questions. I am from far away (Brazil) and many of the things included in the plan and recipes are either not seasonal right now, or extremely overpriced (i.e. berries, pomegranate). So I will have to choose from a quite different universe of foods, especially if I want to focus on organic. Even though you told some of the commenters above that sticking to fruits and vegetables in this first week would do the trick, I know that there are certain foods that are not the best when detoxing, like bananas. And our farmer markets around here are not like yours, we have much smaller options. Can you help me make smarter choices? Are there any set of rules that I can base my ingredient choices, lets say, foods to prioritize or some foods to avoid? Also, organic is obviusly better if I want to let go of the toxins. But is it essential to eat organic in this cleanse? Thanks so much! Sarah, Thank you dearly for sharing these recipes! I’ve tried the green smoothie, butternut squash soup and beet soup so far and they are all delicious. I’m a long term cheeseburger and nothing green girl so I’m thrilled to have found recipes that were so delicious and outside of my comfort zone. Beets for those of us who have never experienced them should come with a warning label and surgical gloves. I now have pink fingers, ruined a shirt and my kitchen is covered in the most beautiful shade of magenta. 😉 Happy to know that the soup was well worth my new pink kitchen. I’ve never eaten beets and thought I hated them but that soup is so satisfying. My husband kept saying how good it was throughout dinner. I’ve never had Kale before and that didn’t seem at all appealing but the green smoothie is delicious and chock full of things I would never normally eat. Thank you for inspiring me! Who knew good for you food could also taste good, certainly not me. 🙂 Thank you for making that possible. We went on a holiday to Switserland this summer and rented a space in a Waldorf school to stay in. The school had it’s own vegetable and flowergarden and they collected and dried leaves, flowers and herbs from the garden. They used these to make a mix that they used for their tea during the schoolseason, very interesting. Many flowers I knew, but had no idea you could use them in tea. I was doing well for 3 days with the cleanse until I cheated with some wine and cheese at a dinner with friends. Does it make sense to continue where I left off in week 1? The recipes have been great so far. Dear Eva – No, don’t start over because of that, just stop consuming it from now on. And because you are vata, cooked foods would be best for your constitution for sure. Try smoothies for breakfast, but watch your temperature – if you’re feeling cold, warm them slightly. Found your blog last fall and love it so far. I’ve had a bunch of weak stomach issues in the past, mostly connected to stress and overwork. Advice from and Ayurvedic specialist helped me out a lot this past fall, so it was cool to find an ayurveda inspired food blog. My housemate and I are starting this now that we’re back at school/ cooking for ourselves again. I’ve been looking at your recipes for inspiration but branching out a little to adjust to what veggies I can get ahold a little easier and on a college student budget. I’ve got two questions. 1. I made three meals (over the past two days) that included blue sky almondmilk before I read all your posts and found that counts as a processed food. I guess I just didn’t really think about it. Should I start over? (do like 9 days of week one) or just not make anything else with processed almond milk for the rest of the cleanse? 2. Does it negate the cleanse if I make more cooked than raw dishes? I was told that cooked food was better for me as a vata type person. I’ll still do raw / smoothies for breakfast. Thanks for the info on honey. Maybe I’ll try adding a few dates to my smoothies instead. My farmer’s market has dried and fresh ones! If you don’t mind I have a few more questions about permitted foods. I know someone mentioned green tea, and you advised on avoiding it. What about white tea? I just purchased a batch and it has only 1% of the caffeine of coffee. I’m guessing rooibos is alright since it is herbal? Thanks so much! My friend and I are very excited about detoxing and getting back to our healthy selves after all the holiday indulgences! I’m going to try this challenge next week. This is the best “detox” plan I’ve ever seen! I’m most excited about the juices and snacks you’ve created. Now I’m motivated! Thank you! As for your snack, your kids could eat it, but you can’t eat any grain-products until week 3 remember…unless you’re there already! Sounds great otherwise. Yum! WOW! you’re really going places with your blog!!! Today I am going to try making a new type of healthy snack for my kids: rice wafer, spread with coconut fat (EV delicious, found it thanks to your christmascake) and sprinkle that with a mix of nuts and dried fruits maybe some sesameseeds that I blitzed in the foodprocessor. I can’t wait, it can’t be anything other than delicious. Would that work for a detox? I started… and I quit after day 2. It’s not that it wasn’t tasty, or wasn’t doable. It was perfectly fine per se, BUT it just left me without any energy, so that I decided to do my “cleanse” less intensely. I’m now simply skipping dairy, most meats, caffeine, nicotine, alcohol, ready-made food etc. When I realized that I just was grumpy all time long and wasn’t even excited about a close friend which i hadn’t seen for years even over, plus that I couldn’t fall asleep, I went to the kitchen and cut a piece of bread for myself. I keep the healthy eating up, continue to follow many of the tips (like smoothies in the morning etc. ), but I just can’t do such a restricted calorie amount at this point. The headaches are normal – you are having what we call a “healing crisis”. This is a sign of successful detoxification, so congrats! As for your trip, stick to gluten-free, whole foods if you can. In a pinch, eat salads without the dressing (unless it is ONLY olive oil and lemon). Bring some energy balls and fresh fruit as snacks in between meals to avoid gas station food, and drink plenty of water. I just started this cleanse on Monday and am half way through Day 3. I feel good about my decision to follow the plan–despite the daily headaches so far– but perhaps my timing wasn’t so practical because I’m going out of town for a few days this weekend. Do you have any tips for sticking to the plan while being away from home? Thank you for the detox plan and wonderful recipes for Week 1. I’m loving your blog! So much inspiration! No, do not eat quinoa even though it is a seed. And no protein powder please! It is far too processed for such a cleanse. You are supposed to be eating fewer calories anyway. If you’re hungry, have an energy ball, a piece of fruit or some veggie sticks! Sarah, my husband and I are starting the cleanse next week, and I have a couple of questions. First, is quinoa appropriate for week 1 as it is technically a seed, not a grain? And second, would it be alright to put whey protein in the smoothies? My husband and I both have a hard time staying full on a smoothie without any. Its great you have a partner in the cleanse – it really helps! I would avoid using sweeteners to your drinks, as it will actually do the opposite of what you think: it will cause cravings! Here’s the thing: when you eat a balanced diet, you won’t crave sweets – I promise! Try the juices and smoothies on their own first. I bet you’ll be surprised at how tasty they are without any added. Hi Sarah, a girlfriend and I are planning on starting the cleanse on Sunday (!!!) and are curious if we can add honey or agave to our smoothies and juices. It would definitely help ward of sweet cravings if we could add it to some peppermint tea! What a cool job and well done on the feature! I am a big fan of your blog and recipes since last fall after I came back from vacations in Denmark. I’ve started the detox program yesterday and so far it feels great! The breakfast smothies are delicious and keep me full all morning. Thanks so much for putting it there for us. Awesome way to start 2012 ! For the following weeks of the cleanse, just sub-in vegan proteins where applicable. For instance, instead of salmon, use a cup of cooked french lentils. Instead of an egg, add a handful of kidney beans to the quinoa for a complete protein. Most of the plan is vegan anyway, so it shouldn’t be so hard! Hi Sara! I’ve looked through the first week of recipes… amazing, and I can’t wait to get started. However, as I’m a vegan, what can I do for the following weeks? Can I even do the first week if it’s the only one I’m willing to do? Hi Anon – bananas are okay, just don’t overdue it. Because of their high glycemic index, they may trigger cravings. Sigrid – avoid cacao until at least week 3 or 4. Although it is very health-supportive, it is extremely stimulating, especially when you are detoxing. Hi Sarah! I am now on day 6 and feel more clear-headed and lighter – wonderful! I am wondering whether raw, organic cacao is allowed at all during the detox? Thanks, Sigrid. I love love your blog and detox plan – thank you so much! Just one question, what’s about bananas? Is it ok to eat them, also in the first week? I am finishing up day 2 of the cleanse and am so happy I decided to do it (despite the nagging caffeine withdraw headache today). The food is incredibly delicious, and I’m even experimenting by adding my own touch every now and then (non-processed touch, that is). What a beautiful job you’ve done! Hi Alyssa – your reaction to caffeine withdrawl is completely normal. I suggest giving it up slowly before the cleanse, otherwise your detox reaction will be even stronger, and perhaps very unpleasant! Hi Sarah! I’m on day 3 and this is definitely a challenge! I am craving cheese and a glass of wine so badly! But I’m not giving in and I am so looking forward to how I will feel in the end. Hi Sarah, I have been a huge fan of you website for a while now. You are so sweet! Anyways, I would love to start this cleanse but my question is about the caffeine. Unfortunately, I am a coffee drinker. Last year I tried to give it up several times and ways only to have major side effect. Would you suggest stop cold turkey and start the cleanse or try to work my way out of the caffeine before starting this cleanse? Yes, the recipes will be up from now on, so you’ll have access to them. Hi! I’ve never done a cleanse before but this one looks really approachable so I’m ready to give it a try! I’ll join late though so my question for you is if the recipes will be available some time after the original cleansing schedule? Thanks for an inspiring blog! Also: does store-bought nutmilk and nutbutters qualify as processed foods? Sarah, your recipes are excellent! They are full of flavor. The grapefruit/carrot/ginger juice in the morning is ADDICTIVE! Just tried the roasted beet soup and actually I liked it-surprising myself. Thanks for all your work! Love this detox, using it before I start my real diet. I have been on it for 5 days. Other then the cravings and headaches I have NOT felt hungry at all. I am not a big raw veggie eater but I was able to eat almost all of the meals this week.I would take some veggies. Lost a total of 9 lbs so far and feel great! Thanks!! You have the right idea! You are welcome to eat outside the diet, as long as you stick the ‘rules’ – just fruits, veggies, nuts + seeds. Green smoothies are great if you can’t juice. Sarah! I’ve read your blog for two years now, and it’s been one of my greatest sources of inspiration as I slowly change my relationship with food. My intentions have been derailed the last few months, and I am excited to start this Monday and give my body and mind a clean slate! Thank you so very much for all that you do and share with us here. Congratulations. It’s amazing. Happy New Year to you! Also, I love the Sous Style article. I have that very teapot in Flame! I was just curious what your thoughts were about eating things outside of the recipes provided in the magazine. The way I see it, the point is just to get as much fruit and veggie matter in me as possible 🙂 (while avoiding processed foods/dairy/gluten etc). In that case, would you suggest mostly trying to eat raw, or trying to mostly consume liquids (so as to give the digestive system a bit of a break) or something else? I know you are generally into juicing, but if that is not an option, what is the next best thing? Thanks a ton, I adore your blog! Love it- starting tomorrow! Thank you!! This is crazy! I started my cleanse two days after christmas. I’m not used to eating meat for every meal, and my stomach did let me know that this was going to be a problem if I contiuned all the way to 2012. The most amazing part, is that after going 80% raw (I’m a sucker for steaming hot vegetable soup, how very difficult it is to live 100% raw in cold Norway) I’m not hungry anymore. Seriously. Thinking about detoxing forever. Love the high energy it gives me. Just bought the magazine after seeing your post. Thank you for the amazing recipes!!! I’m really excited about starting this with my husband. It will be the first time I try something like this. I love that the photos make it look inviting and bright and beautiful. The recipes sound delicious. Thank you!!! I’ve put together a binder with the magazine article and things printed off the website accompanying information. Love the menu! Is there a grocery list available? It would really save me some time. If so could you post it? I got the mag last night based on the cover – lovely. Thanks. Hi Evyn – oh no! Non-stop heartburn! Awful. This could be caused by a number of things, and if this diet is a major change for you, that could be the case. To get some relief try a couple teaspoons of apple cider vinegar in an 8oz. glass of water and drink up. Or brew some Slippery Elm or Marshmallow tea. Is it normal to have non-stop heartburn during first week? Ooh, this detox looks so. . delicious, ha! If I can convince my hubby to do it as well, we might give it a go. Your blog is beautiful btw, just spent a bunch of time bookmarking some delicious looking recipes! Thanks Sarah, for the clarification. I won’t sweat it. Since I’ve started, I’ve really enjoyed these recipes. Hi Pam – please do not worry about the calorie count for such a small period of time. You are SUPPOSED to be eating fewer calories, and for you to get 800 in a day is impressive! When I do a juice fast for instance, I probably get 400 a day and I am fine. Hungry, yes, but fine. The idea behind this is that the body rests. You’ll be surprised at what you can get by on and feel great. If you’re dizzy and starving, of course have a bite to eat, but it’s now time to slow things down and give your digestion a much-needed break. Anon – you can of course work out, but I recommend yoga and walking this first week. Remember it’s resting time. If you feel you have tons of energy to burn off, go for it. If you feel a little less energetic, listen to your body and take it easy. Just started this today, cannot wait to try all the lovely recipes! But I was wondering: is it recommended not to do hard exercise the first week/during the whole cleanse, or does it depend on how you feel overall? Thank you so much for this cleanse Sarah! I’m on day four of week one and I’m feeling great. Feeling clear headed, energetic, and losing weight at the same time 🙂 especially love the smoothie modifications since I don’t have a juicer, the butternut squash soup and steamed broccoli dish. Looking forward to week two! How do I get enough calories? Obviously I can eat more, but do you have have suggestions beyond that? So far my calorie total today was 800. I am an avid runner and pretty active. This won’t be nearly enough, even if it’s temporary. PS- Love the Dried Fruit + Nut bites. I think it’s so funny that I found your blog after I already decided to commit last month! I am totally doing this and having serval of my college roommates and friends join me. Being allergic to gluten, dairy and nuts anyways; it seems like a great way to start the year! Hello Pamela – it’s awesome you bought a Vita-mix, congrats! I would still recommend that you use the blender for smoothies and the juicer for juice. If you don’t have a juicer, use the Vita-mix and drink up. The point of all this is that you are cutting out processed foods and introducing more plant-based foods. However you get them in ya is great! Hey everyone – I am getting a lot of comments and questions about protein, so let me clear things up: Yes, protein is an essential part of your diet, and although on this one-week plan you will of course take in less than an SAD, but you’ll still be getting enough from the green juices, leafy greens, nuts and seeds for the purpose of cleansing. Think about people who juice fast for months at a time – they live, and live with vibrancy! If you are nervous about this at all, stir a tablespoon of chlorella or spirulina into your drinks. I’ve been reading your blog for quite a while now (every morning at breakfast) and I felt like I just had to finally post a comment. Eyeing through the cleanse it sure looks inviting! The recipes look fantastic and since I’ve already cooked a lot of your recipes I know that they will taste good, they always do! There is only one thing that concerns me, as another comment above noticed as well, the lack of protein. From what I’ve gathered from various resources your body needs about 2 grams of protein per kilogram of body weight. Worth mentioning is that this recommendation is mainly for people who do a lot of heavy weight lifting, wich I happen to do. Just to put things in perspective, I usually lift weights 4 days a week and do wither Yoga or heavy cardio 3 days a week. Would I still be fine with such small amounts of protein even if I work out like I do? Anyhow, thanks a lot for a fantastic and inspiring blog! I just got a Vitamix for christmas this year! I have read your explanation in the past of how juicing is different from smoothies or blended juices, because it extracts only the juice so your body doesn’t have to work so hard to break down the fiber. However, i have learned (please correct me if i am wrong) that the Vitamix can break down fiber so small that our body doesn’t have to work to digest it. So, what do you recommend i do for the breakfast juices- juice with the Vitamix or the smoothie alternatives? Thanks so much, and I look forward to starting the cleanse when i return home next week! Since I see beets there, I’ll issue a friendly reminder about their crimson effect on bodily output. I almost took myself to the emergency room this week after a frightening episode in the restroom. Fortunately, I remembered that I had eaten beets the day before, but it was terrifically frightening for a few minutes. I’ve never been a beet eater, but have been seriously craving them lately. Yay for seasonal eating and listening to my body! I just checked out the recipes and they look delicious! As much as I love the internet I would love to buy the magazine, going to do it today! Thanks for the kick in the rear…. Would it be really terrible to start week 2 two days early? I have a family party on Saturday and I feel like if I am still on week one I will be more tempted to cheat or stop altogether. 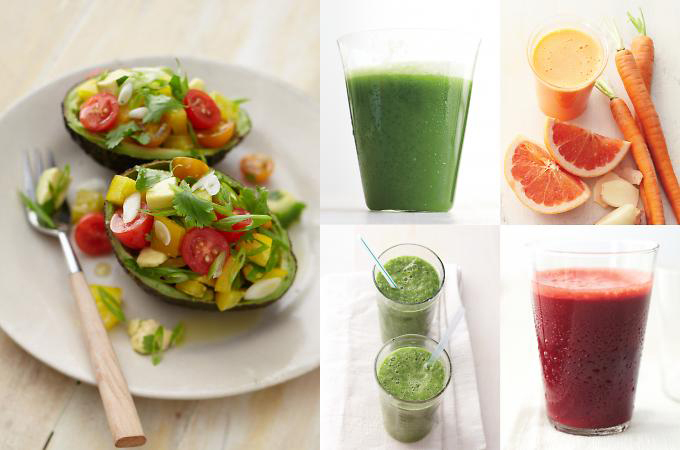 Sarah, you even make detoxing so delicious! I am still in India but will surely attempt this cleanse when back in Europe in February. I can’t tell you how much I am looking forward to eating vegetables without a heavy sauce. Your kale slaw with red cabbage and carrot sounds like the perfect start. So happy that you’re excited about this cleansing program and wanting to give it a try! Hibou + Pamela – It’s really hard for me to approve of nursing women to do this program because it depends on your level of toxicity. Of course this is going to detox your body to some extent, but that all depends on your what your load is at the moment. I think you should see a holistic nutritionist to determine this first. Melissa – get your husband on board, he won’t be hungry! Cigi – definitely wait until you’re finished the meds – you’ll want to get them out of your system in the end anyway. And NO tea, as it contains caffeine as well. Ms. F – I have no idea what will fill you up because I am not you! Try everything and see. Eat more if you’re hungry. Monica – you are having a healing crisis. This is normal and a good sign. Ride it out, it won’t last much longer. It has nothing to do with protien, just your cells dumping toxins into your blood stream for excretion. Yay! Sophie – no green tea, stick to herbal tea only. THANK YOU for making this cleanse something approachable and delicious- I had been thinking about trying one and now I absolutely will! Have to say, I was very,very worried about feeling hungry and tired in the first place, but, so far, everything works out fine. if it’s okay to consume green tea during the cleanse? Thank you so much, Sarah !!! I actually found Whole Living and your blog in the space of a week completely independently–crazy! I just wanted to comment and ask if you knew anything about the website Pinterest? I’ve been “pinning” a lot of your recipes (with links back to your blog!) and it seems as if a lot of people are really enthusiastic. It’s a really great community full of beautiful images, recipes, tips, tricks, etc. And it would be a great way to bring more readers in (as I think I have in the last 24 hours of crazy pinning!) Thank you for this phenomenal blog, and I look forward to all of your new recipes while I work my way back to 2007! I started this on january 2 but am having a difficult time. Right now for instance I feel nauseous. Yesterday I had a terrible headache all day. How can I stick to this diet without having these disrupting symptoms and is it really safe for me to go a whole week with no protein at all? Congrats Sarah! I got my issue in the mail recently. All of your recipes look stunning and it doesn’t seem like a detox as much as a display of beautiful and healthy recipes! You read my mind. I’ve been looking for a whole foods cleanse, and this is perfect. I’m in, Sarah! The recipes look delicious. Nice work! from 1 nutritionist to another, this looks awesome. You best believe I’ll be doing this! I’m so excited because I’ve always wanted to do a detox plan but never say one that was exactly right for me. Started the detox on Monday. I love the avocado and kale slaw dishes. The amount of vegetables/fruits for the juices often make more than the portion size detailed. I’ve been scaling back on the recipes, which means that most of my week 1 food will be rolling over into next week. Other than the avocado dish, which other recipes will help with feeling full? I’ve made the butternut squash and kale slaw, but I feel like I eat sooner than normal after I finish those meals. I was just reading through the Whole Living magazine last night when I saw your feature! It looks great, nice work Sarah! Can’t wait to try a few of the recipes! p.s. seriously loving your wallpaper from the Sous Style photo! I have been reading the first week detox diet and sounds great, I really fancy doing it but I have a question. I am know having some medication and I wonder if the detox diet will really have an effect since I have to continue with the medication for at least 3 months more. Do you think that it will really worths? Or I would rather wait until I finish it? Another question is if the caffeine ban includes also tea. I love this magazine and loved your section this month! Already made a few things from it, and I am not even cleansing! oh my…I’m going to do it! The only challenge is getting my man on board 100%. He is always hungry! Started Monday. I cooked some of the food ahead. Amazingly I have not felt hungry at all. A little bit of a headache yesterday, but it’s gone now. Your recipes are great, the food tastes clean and alive. The butternut squash soup is fantastic. I’ve noticed that you use ginger in a lot of the recipes, is that to make the food “warming?” The only recipe that seemed a little off to me was the grapefruit carrot juice- with two whole grapefruits it made more than filled a tall glass. I think I might want to try it with only one whole grapefruit. I absolutely cannot wait to start this! My hubby and I go on vacation soon, where I know we will not be eating well, so this will be just perfect to start once we get home. I adore your blog Sarah – Your photography and recipes are just gorgeous and your writing is a delight to read. Not to mention, everything you post looks so delicious. Thank you for all the food and health inspiration! Best wishes for an amazing 2012! Woop woop!!! How exciting! Can’t wait to start it 🙂 I’m a nursing mama too, to a 9 month old (hibou left a comment about it) – so I just eat a bit more of the good stuff. The bad detoxes in my opinion right now are the ones that suggest fasting or only juice. This one looks great! Cucumber!! That’s a great idea, I love cucumber. I always cut up extra for my italian-style salad. I truly enjoyed this feature, much more than most columns in the Whole Living Magazine, and am so happy to learn that you were responsible! Congrats, it’s a beautiful and inspiring piece. There’s a lot of wisdom there even for those who don’t “detox” like myself. If you want to stick with raw, slice a cucumber lengthwise, hollow it out like a canoe, and use the same filling to stuff it. For a cooked version, try any kind of winter squash, roast it, and add the filling after! I am so keen to detoxify my body, but I have an 8-month-old and I know some cleanses are not recommended for nursing women. What do you suggest? The thought of a detox that includes food created by you is sooo appealing! Tell me I don’t have to wait until I finish nursing in 16 months!!! Wohooo! You are such a Superhero Sarah! Many many awesome things comes to your new roots:) I am so happy you share your advise, humor and passion – it´s a a blast to read;) Hugs & Blissed out love! I was so excited to see that you were involved in this year’s detox! I started the plan yesterday, and I made a big batch of your butternut squash soup, delicious! I’m going to make one of your salads tonight. I saw it! I have it! I’m looking at it now! Coooongrats. I’m so going to shove every single thing into my face all month. Wee! I just got my issue in the mail and am looking forward to reading through the week by week detox plan. Everything looks delicious!